Northumberland (/nɔːrˈθʌmbərlənd/; abbreviated Northd) is a county in North East England. The northernmost county of England, it borders Cumbria to the west, County Durham and Tyne and Wear to the south and the Scottish Borders to the north. To the east is the North Sea coastline with a 64 miles (103 km) path. The county town is Alnwick, although the County council is based in Morpeth. The county of Northumberland included Newcastle upon Tyne until 1400, when the city became a county of itself. Northumberland expanded greatly in the Tudor period, annexing Berwick-upon-Tweed in 1482, Tynedale in 1495, Tynemouth in 1536, Redesdale around 1542 and Hexhamshire in 1572. Islandshire, Bedlingtonshire and Norhamshire were incorporated into Northumberland in 1844. Tynemouth and other settlements in North Tyneside were transferred to Tyne and Wear in 1974 under the Local Government Act 1972. Lying on the Anglo-Scottish border, Northumberland has been the site of a number of battles. The county is noted for its undeveloped landscape of high moorland, now largely protected as the Northumberland National Park. Northumberland is the least densely populated county in England, with only 62 people per square kilometre. Northumberland originally meant 'the land of the people living north of the River Humber'. The present county is the core of that former land, and has long been a frontier zone between England and Scotland. During Roman occupation of Britain, most of the present county lay north of Hadrian's Wall. It was controlled by Rome only for the brief period of its extension of power north to the Antonine Wall. The Roman road Dere Street crosses the county from Corbridge over high moorland west of the Cheviot Hills into present Scotland to Trimontium (Melrose). As evidence of its border position through medieval times, Northumberland has more castles than any other county in England, including those at Alnwick, Bamburgh, Dunstanburgh, Newcastle and Warkworth. Northumberland has a rich prehistory with many instances of rock art, hillforts such as Yeavering Bell, and stone circles such as the Goatstones and Duddo Five Stones. Most of the area was occupied by the Brythonic-Celtic Votadini people, with another large tribe, the Brigantes, to the south. Later, the region of present-day Northumberland formed the core of the Anglian kingdom of Bernicia (from about 547), which united with Deira (south of the River Tees) to form the kingdom of Northumbria in the 7th century. The historical boundaries of Northumbria under King Edwin (reigned 616–633) stretched from the Humber in the south to the Forth in the north. After the battle of Nechtansmere its influence north of the Tweed began to decline as the Picts gradually reclaimed the land previously invaded by the Saxon kingdom. In 1018 its northern part, the region between the Tweed and the Forth (including Lothian that contains present-day Edinburgh), was ceded to the Kingdom of Scotland. Northumberland is often called the "cradle of Christianity" in England, because Christianity flourished on Lindisfarne—a tidal island north of Bamburgh, also called Holy Island—after King Oswald of Northumbria (reigned 634–642) invited monks from Iona to come to convert the English. A monastery at Lindisfarne was the centre of production of the Lindisfarne Gospels (around 700). It became the home of St Cuthbert (about 634–687, abbot from about 665), who is buried in Durham Cathedral. Bamburgh is the historic capital of Northumberland, the royal castle from before the unification of the Kingdoms of England under the monarchs of the House of Wessex in the 10th century. The Earldom of Northumberland was briefly held by the Scottish royal family by marriage between 1139–1157 and 1215–1217. Scotland relinquished all claims to the region as part of the Treaty of York (1237). The Earls of Northumberland once wielded significant power in English affairs because, as powerful and militaristic Marcher Lords, they had the task of protecting England from Scottish retaliation for English invasions. Northumberland has a history of revolt and rebellion against the government, as seen in the Rising of the North (1569–1570) against Elizabeth I of England. These revolts were usually led by the Earls of Northumberland, the Percy family. Shakespeare makes one of the Percys, the dashing Harry Hotspur (1364–1403), the hero of his Henry IV, Part 1. The Percys were often aided in conflict by other powerful Northern families, such as the Nevilles and the Patchetts. The latter were stripped of all power and titles after the English Civil War of 1642–1651. After the Restoration of 1660, the county was a centre for Roman Catholicism in England, as well as a focus of Jacobite support. Northumberland was long a wild county, where outlaws and Border Reivers hid from the law. However, the frequent cross-border skirmishes and accompanying local lawlessness largely subsided after the Union of the Crowns of Scotland and England under King James I and VI in 1603. Northumberland played a key role in the Industrial Revolution from the 18th century on. Many coal mines operated in Northumberland until the widespread closures in the 1970s and 1980s. Collieries operated at Ashington, Bedlington, Blyth, Choppington, Netherton, Ellington and Pegswood. The region's coalfields fuelled industrial expansion in other areas of Britain, and the need to transport the coal from the collieries to the Tyne led to the development of the first railways. Shipbuilding and armaments manufacture were other important industries before the deindustrialisation of the 1980s. Northumberland remains largely rural, and is the least-densely populated county in England. In recent years the county has had considerable growth in tourism. Visitors are attracted both to its scenic beauty and its historical sites. Northumberland has a diverse physical geography. It is low and flat near the North Sea coast and increasingly mountainous toward the northwest. The Cheviot Hills, in the northwest of the county, consist mainly of resistant Devonian granite and andesite lava. A second area of igneous rock underlies the Whin Sill (on which Hadrian's Wall runs), an intrusion of Carboniferous dolerite. Both ridges support a rather bare moorland landscape. Either side of the Whin Sill the county lies on Carboniferous Limestone, giving some areas of karst landscape. Lying off the coast of Northumberland are the Farne Islands, another dolerite outcrop, famous for their bird life. There are coal fields in the southeast corner of the county, extending along the coastal region north of the river Tyne. The term 'sea coal' likely originated from chunks of coal, found washed up on beaches, that wave action had broken from coastal outcroppings. Being in the far north of England, above 55° latitude, and having many areas of high land, Northumberland is one of the coldest areas of the country. However, the county lies on the east coast, and has relatively low rainfall, with the highest amounts falling on the high land in the west. Approximately a quarter of the county is protected as the Northumberland National Park, an area of outstanding landscape that has largely been protected from development and agriculture. The park stretches south from the Scottish border and includes Hadrian's Wall. Most of the park is over 240 metres (790 feet) above sea level. The Northumberland Coast is also a designated Area of Outstanding Natural Beauty (AONB). A small part of the North Pennines AONB is also in the county. There is a variety of notable habitats and species in Northumberland including: Chillingham Cattle herd; Holy Island; Farne Islands; and Staple Island. Moreover, 50% of England's red squirrel population lives in the Kielder Water and Forest Park along with a large variety of other species including roe deer and wildfowl. Northumberland's green belt is in the south of the county, surrounding Cramlington and other communities along the county border, to afford a protection from the Tyneside conurbation. The belt continues west along the border, past Darras Hall, and on to Hexham, stopping before Haydon Bridge. Its border there is shared with the North Pennines AONB. There are also some separated belt areas, for example to the east of Morpeth. The green belt was first drawn up in the 1950s. Northumberland's industry is dominated by some multi-national corporations: Coca-Cola, MSD, GE and Drager all have significant facilities in the region. Tourism is a major source of employment and income in Northumberland. In the early 2000s the county annually received 1.1 million British visitors and 50,000 foreign tourists, who spent a total of £162 million. Coal mining in the county goes back to Tudor times. Coal mines continue to operate today; many of them are open-cast mines. Planning approval was given in January 2014 for an open-cast mine at Halton Lea Gate near Lambley, Northumberland. A major employer in Northumberland is Hexham based Egger (UK) Limited. Pharmaceutical, healthcare and emerging medical biotechnology companies form a very significant part of the county's economy. Many of these companies are part of the approximately 11,000-worker Northeast of England Process Industry Cluster (NEPIC) and include Aesica Pharmaceuticals, Covance, MSD, Piramal Healthcare, Procter & Gamble, Shire Plc (formerly SCM Pharma), Shasun Pharma Solutions, Specials Laboratory, and Thermo Fisher Scientific. The cluster also includes Cambridge Bioresearch, GlaxoSmithKline, Fujifilm Dyosynth Biotech, Leica Bio, Data Trial, High Force Research, Non-Linear Dynamics, and Immuno Diagnostic Systems (IDS). The towns of Alnwick, Cramlington, Morpeth, Prudhoe all have significant pharmaceutical factories and laboratories. Newcastle University and Northumbria University are the leading academic institutions nearby. The local industry includes commercial or academic activity in pre-clinical research and development, clinical research and development, pilot-scale manufacturing, full-scale active pharmaceutical ingredient/intermediate manufacturing, formulation, packaging, and distribution. Northumberland has a completely comprehensive education system, with 15 state schools, two academies and one independent school. Like Bedfordshire, it embraced the comprehensive ideal with the three-tier system of lower/middle/upper schools with large school year sizes (often around 300). This eliminated choice of school in most areas: instead of having two secondary schools in one town, one school became a middle school and another became an upper school. A programme introduced in 2006 known as Putting the Learner First has eliminated this structure in the former areas of Blyth Valley and Wansbeck, where two-tier education has been introduced. Although the two processes are not officially connected, the introduction of two tiers has coincided with the move to build academy schools in Blyth, with Bede Academy and in Ashington at Hirst. One response to these changes has been the decision of Ponteland High School to apply for Trust status. Cramlington Learning Village has almost 400 pupils in each school year, making it one of the largest schools in England. The Blyth Academy in southeast Northumberland can hold 1,500 students throughout the building. Astley Community High School in Seaton Delaval, which accepts students from Seaton Delaval, Seaton Sluice and Blyth, has been the subject of controversial remarks from politicians claiming it would no longer be viable once Bede Academy opened in Blyth, a claim strongly disputed by the headteacher. Haydon Bridge High School, in rural Northumberland, is claimed to have the largest catchment area of any school in England, reputedly covering an area larger than that encompassed by the M25 motorway around London. The county of Northumberland is served by one Catholic high school, St Benet Biscop Catholic Academy in Bedlington, which is attended by students from all over the area. Students from Northumberland also attend independent schools such as the Royal Grammar School in Newcastle. At the Census 2001 Northumberland registered a population of 307,190, estimated to be 309,237 in 2003, The 2011 census gave a population of 316,028. In 2001 there were 130,780 households, 10% of which were all retired, and one third were rented. Northumberland has a very low ethnic minority population at 0.985% of the population, compared to 9.1% for England as a whole. In the 2001 census, 81% of the population reported their religion as Christianity, 0.8% as "other religion", and 12% as having no religion. Being primarily rural with significant areas of upland, the population density of Northumberland is only 62 persons per square kilometre, giving it the lowest population density in England. Northumberland is a unitary authority area and is the largest unitary area in England. The County Council is based in Morpeth. Like most English shire counties Northumberland had until April 2009 a two-tier system of local government, with one county council and six districts, each with their own district council, responsible for different aspects of local government. These districts were Blyth Valley, Wansbeck, Castle Morpeth, Tynedale, Alnwick and Berwick-upon-Tweed. The districts were abolished on 1 April 2009, the county council becoming a unitary authority. Northumberland is included in the North East England European Parliament constituency which is represented by three Members of the European Parliament. On 23 June 2016, Northumberland took part in the UK-wide referendum on the UK's membership of the EU. In Northumberland a majority voted to Leave the European Union. Northumberland has traditions not found elsewhere in England. These include the rapper sword dance, the clog dance and the Northumbrian smallpipe, a sweet chamber instrument, quite unlike the Scottish bagpipe. Northumberland also has its own tartan or check, sometimes referred to in Scotland as the Shepherd's Tartan. Traditional Northumberland music has more similarity to Lowland Scottish and Irish music than it does to that of other parts of England, reflecting the strong historical links between Northumbria and the Lowlands of Scotland, and the large Irish population on Tyneside. The border ballads of the region have been famous since late mediaeval times. Thomas Percy, whose celebrated Reliques of Ancient English Poetry appeared in 1765, states that most of the minstrels who sang the border ballads in London and elsewhere in the 15th and 16th centuries belonged to the North. The activities of Sir Walter Scott and others in the 19th century gave the ballads an even wider popularity. William Morris considered them to be the greatest poems in the language, while Algernon Charles Swinburne knew virtually all of them by heart. One of the best-known is the stirring "Chevy Chase", which tells of the Earl of Northumberland's vow to hunt for three days across the Border "maugre the doughty Douglas". Of it, the Elizabethan courtier, soldier and poet Sir Philip Sidney famously said, "I never heard the old song of Percy and Douglas that I found not my heart moved more than with a trumpet". Ben Jonson said that he would give all his works to have written "Chevy Chase". Overall the culture of Northumberland, as with the North East of England in general, has much more in common with Scottish Lowland culture than with that of Southern England. One reason is that both regions have their cultural origins in the old Anglian Kingdom of Northumbria, a fact borne out by the linguistic links between the two regions. These include many Old English words not found in other forms of Modern English, such as bairn for child (see Scots language and Northumbria). The other reason for the close cultural links is the clear pattern of net southward migration. There are more Scots in England than English people north of the border. Much of this movement is cross-county rather than distant migration, and the incomers thus bring aspects of their culture as well as reinforce shared cultural traits from both sides of the Anglo-Scottish border. Whatever the case, the lands just north or south of the border have long shared certain aspects of history and heritage; it is thus thought by some that the Anglo-Scottish border is largely political rather than cultural. Attempts to raise the level of awareness of Northumberland culture have also started, with the formation of a Northumbrian Language Society to preserve the unique dialects (Pitmatic and other Northumbrian dialects) of this region, as well as to promote home-grown talent. Northumberland's county flower is the bloody cranesbill (Geranium sanguineum) and her affiliated Royal Navy ship is her namesake, HMS Northumberland. Northumberland has its own flag, which is a banner of the arms of Northumberland County Council. The shield of arms is in turn based on the arms medieval heralds had attributed to the Kingdom of Bernicia (which the first County Council used until was granted its own arms). The Bernician arms were fictional but inspired by Bede's brief description of a flag used on the tomb of St Oswald in the 7th century. The current arms were granted to the county council in 1951, and adopted as the flag of Northumberland in 1995. Having no large population centres, the county's mainstream media outlets are served from nearby Tyne and Wear, including radio stations and television channels (such as BBC Look North, BBC Radio Newcastle, Tyne Tees Television and Metro Radio), along with the majority of daily newspapers covering the area (The Journal, Evening Chronicle). It is worth remembering however that although Northumberland, like many administrative areas in England, has been shorn of its geographical regional centre, that centre—Newcastle upon Tyne—remains an essential element within the entity we know as Northumberland. Newcastle's newspapers are as widely read in its Northumbrian hinterland as any of those of the wider county: the Northumberland Gazette, Morpeth Herald, Berwick Advertiser, Hexham Courant and the News Post Leader. Lionheart Radio, a community radio station based in Alnwick, has recently been awarded a five-year community broadcasting licence by Ofcom. Radio Borders covers Berwick and the rural north of the county. Ashington was the birthplace of the three famous footballers Bobby and Jack Charlton in 1937 and 1935, respectively; and Jackie Milburn previously in 1924. In 1978 Steve Harmison, an international cricketer was born here. Mickley was the birthplace of Thomas Bewick, an artist, wood engraver and naturalist in 1753 and Bob Stokoe, a footballer and F.A. Cup winning manager (with Sunderland in 1973) born 1930. Tom Graveney, former England cricketer and President of the Marylebone Cricket Club 2004/5, born in Riding Mill in 1927. Jean Heywood actress born at Blyth best known for Our Day Out and All Creatures Great and Small. Kevin Whately, actor born in Humshaugh, near Hexham in 1951. Richard Pattison, climber born in Ashington in 1975. Matthew Festing, 79th Grand Master, the Order of Malta. Mark Knopfler, guitarist and frontman of Dire Straits, was raised in his mother's hometown of Blyth, Northumberland. Alan Shearer footballer, lives in Ponteland. J. M. W. Turner, Thomas Girtin and John Cotman all painted memorable pictures of Northumberland. Turner always attributed Norham Castle as the foundation of his fame and fortune. Jonny Wilkinson, English rugby player, currently lives in rural Northumberland. Allan Holdsworth, guitarist, originated from Newcastle upon Tyne before moving to California. The site  contains exhaustive detailed entries for notable deceased Northumbrians. NOTE: New parishes have been added since 2001. These are missing from the list. Although not on this list, the population of Cramlington is estimated at 39,000. ^ "Northumberland definition and meaning - Collins English Dictionary". Collinsdictionary.com. ^ "Northumberland Coast Path – LDWA Long Distance Paths". Ldwa.org.uk. Retrieved 15 December 2012. ^ "Alnwick". Northumberland County Council. Retrieved 14 June 2014. ^ "History of Newcastle upon Tyne" (PDF). Local Studies Factsheet No. 6. Newcastle City Council. 2009. p. 2. Retrieved 14 June 2014. ^ Daniell, Christopher (2013). "Tudor Expansion of the County of Northumberland". Atlas of Early Modern Britain, 1485–1715. London: Routledge. p. 5. ISBN 0415729246. ^ "The palatinate of Durham". Durham University Library Special Collections Catalogue. Durham University. Retrieved 14 June 2014. ^ Long, B. (1967). Castles of Northumberland. Newcastle, UK: Harold Hill. ^ Adams, Sharon; Goodare, Julian (2014). Scotland in the Age of Two Revolutions. Woodbridge: Boydell. pp. 38–39. ISBN 9781843839392. Retrieved 28 August 2014. ^ Northumberland National Park Authority, n.d. "The topology and climate of Northumberland National Park." ^ Met Office, 2000. "Annual average rainfall for the United Kingdom." ^ "National Character Area profiles: data for local decision making". Gov.uk. Retrieved 14 December 2018. ^ "The leading companies shaping Northumberland's business landscape". Arch. Archived from the original on 14 December 2012. Retrieved 19 September 2013. ^ "Major Hexham employer Egger UK". Chroniclelive.co.uk. ^ "Hexham employer Egger UK posts rise". Chroniclelive.co.uk. ^ "Invest in Northumberland: Key sectors". ARCH. Archived from the original on 14 December 2012. Retrieved 19 September 2013. ^ NEPIC Directory 2013 Pharmaceuticals: Manufacturing Creates Value. Northeast of England Process Industry Cluster. May 2013. p. 33. ^ Farrows. "CDMO for APIs & finished dosage forms". Aesica-pharma.com. Retrieved 14 December 2018. ^ "Northumberland-based SCM Pharma's trading assets acquired". Thejournal.co.uk. ^ "Shasun Pharma Solutions". Shasun.com. Archived from the original on 28 November 1999. ^ "Unlicensed Medicines Supplier - Specials Medicines Manufacturing". Specialslab.co.uk. ^ "Invest in the Northumberland business landscape". Archnorthumberland.co.uk. Archived from the original on 14 December 2012. Retrieved 19 September 2013. ^ "Pharmaceuticals Brochure" (PDF). Northeast of England Process Industry Cluster. Archived from the original (PDF) on 4 September 2015. Retrieved 19 September 2013. ^ "Local Authority population 2011". Retrieved 1 July 2015. ^ Office for National Statistics, 2001. "KS07 Religion: Census 2001, Key Statistics for local Authorities." ^ a b "North East England History Pages". Northeastengland.talktalk.net. Retrieved 25 September 2010. ^ a b c "Northumbrian Language Society". Northumbriana.org.uk. Retrieved 25 September 2010. ^ "Lowlands-L • a discussion group for people who share an interest in languages and cultures of the Lowlands". Lowlands-l.net. Retrieved 25 September 2010. ^ Bede's Ecclesiastical History of the English People, Book III, Ch. 11: "And to furnish a lasting memorial of the royal saint, they hung the King's banner of purple and gold over his tomb." 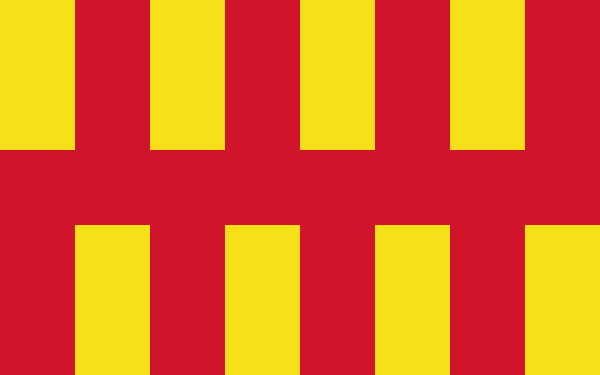 ^ "The Northumberland Flag Northumberland Northumbria England UK GB (page 113)". Web.archive.org. 24 June 2005. Archived from the original on 24 June 2005. Retrieved 25 September 2010. ^ Wilford, N. (1993). The life and work of William Hewson, haematol- ogist and immunologist. In: Medicine in Northumbria; Essays on the History of Medicine in the North East of England (Chapter 8). New- castle-upon-Tyne. : Pybus Society for the History and Bibliography of Medicine. ISBN 978-0952209706. ^ Neighbourhood Statistics. "Office for National Statistics". Neighbourhood Statistics. Retrieved 25 September 2010. Sharp, Thomas (1937). Northumberland and Durham – a Shell Guide. B.T. Batsford. Tomlinson, W.W. (1968) . Comprehensive guide to the county of Northumberland. Trowbridge: Redwood. Thompson, Barbara; Norderhaug, Jennifer (2006). Walking the Northumberland Dales: Hadrian's Wall Country. Sigma Press. ISBN 1-85058-838-4. Alnwick ( (listen) AN-ik) is a market town in north Northumberland, England, of which it is the traditional county town. The population at the 2011 Census was 8,116. The town is on the south bank of the River Aln, 32 miles (51 km) south of Berwick-upon-Tweed and the Scottish border, 5 miles (8 km) inland from the North Sea at Alnmouth and 34 miles (55 km) north of Newcastle upon Tyne. The town dates to about AD 600, and thrived as an agricultural centre. Alnwick Castle was the home of the most powerful medieval northern baronial family, the Earls of Northumberland. It was a staging post on the Great North Road between Edinburgh and London, and latterly has become a dormitory town for nearby Newcastle-upon-Tyne. The town centre has changed relatively little, but the town has seen some growth, with several housing estates covering what had been pasture, and new factory and trading estate developments along the roads to the south. Alnwick Castle ( (listen)) is a castle and country house in Alnwick in the English county of Northumberland. It is the seat of His Grace The 12th Duke of Northumberland, built following the Norman conquest and renovated and remodelled a number of times. It is a Grade I listed building and as of 2012 received over 800,000 visitors per year. Berwick-upon-Tweed ( (listen); Scots: Sooth Berwick, Scottish Gaelic: Bearaig a Deas) is a town in the county of Northumberland. It is the northernmost town in England, at the mouth of the River Tweed on the east coast, 2 1⁄2 miles (4 km) south of the Scottish border (the hamlet of Marshall Meadows 2 miles (3 km) to the north is the actual northernmost settlement). Berwick is approximately 56 miles (90 km) east-south east of Edinburgh, 65 miles (105 km) north of Newcastle upon Tyne and 345 miles (555 km) north of London. The United Kingdom census, 2011 recorded Berwick's population as 12,043. A civil parish and town council were created in 2008 comprising the communities of Berwick, Spittal and Tweedmouth.Berwick was founded as an Anglo-Saxon settlement during the time of the Kingdom of Northumbria, which was annexed by England in the 10th century. The area was for more than 400 years central to historic border wars between the Kingdoms of England and Scotland, and several times possession of Berwick changed hands between the two kingdoms. The last time it changed hands was when Richard of Gloucester retook it for England in 1482. To this day many Berwickers feel a close affinity to Scotland.Berwick remains a traditional market town and also has some notable architectural features, in particular its medieval town walls, its Georgian Town Hall, its Elizabethan ramparts, and Britain's earliest barracks buildings, which Nicholas Hawksmoor built (1717–21) for the Board of Ordnance. Blyth () is a town and civil parish in southeast Northumberland, England. It lies on the coast, to the south of the River Blyth and is approximately 13 miles (21 km) northeast of Newcastle upon Tyne. It has a population of about 37,339.The port of Blyth dates from the 12th century, but the development of the modern town only began in the first quarter of the 18th century. The main industries which helped the town prosper were coal mining and shipbuilding, with the salt trade, fishing and the railways also playing an important role. These industries have largely vanished, but the port still thrives, shipping paper and pulp from Scandinavia for the newspaper industries of England and Scotland.The town was seriously affected when its principal industries went into decline, and it has undergone much regeneration since the early 1990s. The Keel Row Shopping Centre, opened in 1991, brought major high street retailers to Blyth, and helped to revitalise the town centre. The market place has recently been re-developed, with the aim of attracting further investment to the town. The Quayside has also seen much redevelopment and has been transformed into a peaceful open space, the centrepiece of which is a sculpture commemorating the industry which once thrived there. There were, on the opposite side of the river are the nine wind turbines of the Blyth Harbour Wind Farm, which were constructed along the East Pier in 1992. They were joined in 2000 by Blyth Offshore Wind Farm, which is composed of two turbines situated 1 kilometre (0.62 mi) out to sea. Although the original nine turbines have now been demolished, there is one larger turbine on the North Blyth side with building work taking place on a second turbine. Blyth is also home to the non-League football club Blyth Spartans, famed for their 1978 "giant-killing" feats in the FA Cup. And in 16/17 season they won the NPL premier division finishing on 101 points. Duke of Northumberland is a noble title that has been created three times in English and British history, twice in the Peerage of England and once in the Peerage of Great Britain. The current holder of this title is Ralph Percy, 12th Duke of Northumberland. Durham/Northumberland 1 is an English Rugby Union league at the seventh tier of the domestic competition, the top level for local rugby union in North East England. The champions are automatically promoted to North 1 East, a division with a wider geographical area which also encompasses Yorkshire. The runners up participates in a playoff against the 2nd place team from the equivalent regional league, Yorkshire 1, for promotion to North 1 East. The bottom two clubs are relegated to Durham/Northumberland 2. Each season two teams from Durham/Northumberland 1 are picked to take part in the RFU Intermediate Cup (a national competition for clubs at level 7) - one affiliated with the Durham County RFU, the other with the Northumberland RFU. Durham/Northumberland 2 is an English Rugby Union league at the eighth tier of the domestic competition for teams from North East England. The champions and runner-up and promoted to Durham/Northumberland 1 and the bottom two clubs are relegated to Durham/Northumberland 3. Each season two teams from Durham/Northumberland 2 are picked to take part in the RFU Senior Vase (a national competition for clubs at level 8) - one affiliated with the Durham County RFU, the other with the Northumberland RFU. Durham/Northumberland 3 is an English Rugby Union league at the ninth tier of the domestic competition and is currently the basement league of club rugby in North East England. Any club in the north east wishing to join the rugby union club hierarchy must begin at the bottom so all new teams from the north east start in this division - although until 2005-06 there was relegation to the now defunct Durham/Northumberland 4. The champions and runner-up and promoted to Durham/Northumberland 2. Each season two teams from Durham/Northumberland 3 are picked to take part in the RFU Junior Vase (a national competition for clubs at levels 9-12) - one affiliated with the Durham County RFU, the other with the Northumberland RFU. Hadrian's Wall (Latin: Vallum Aelium), also called the Roman Wall, Picts' Wall, or Vallum Hadriani in Latin, was a defensive fortification in the Roman province of Britannia, begun in AD 122 in the reign of the emperor Hadrian. It ran from the banks of the River Tyne near the North Sea to the Solway Firth on the Irish Sea, and was the northern limit of the Roman Empire, immediately north of which were the lands of the northern Ancient Britons, including the Picts. It had a stone base and a stone wall. There were milecastles with two turrets in between. There was a fort about every five Roman miles. From north to south, the wall comprised a ditch, wall, military way and vallum, another ditch with adjoining mounds. It is thought the milecastles were staffed with static garrisons, whereas the forts had fighting garrisons of infantry and cavalry. In addition to the wall's defensive military role, its gates may have been customs posts.A significant portion of the wall still stands and can be followed on foot along the adjoining Hadrian's Wall Path. The largest Roman archaeological feature anywhere, it runs a total of 73 miles (117.5 kilometres) in northern England. Regarded as a British cultural icon, Hadrian's Wall is one of Britain's major ancient tourist attractions. It was designated as a UNESCO World Heritage Site in 1987. In comparison, the Antonine wall, thought by some to be based on Hadrian's wall (the Gillam hypothesis), was not declared a World Heritage site until 2008.It is a common misconception that Hadrian's Wall marks the boundary between England and Scotland. In fact Hadrian's Wall lies entirely within England and has never formed the Anglo-Scottish border. While it is less than 0.6 mi (1.0 km) south of the border with Scotland in the west at Bowness-on-Solway, in the east at Wallsend it is as much as 68 miles (109 km) away. Hexham ( HEKS-əm) is a market town and civil parish in Northumberland, England, south of the River Tyne, and was the administrative centre for the Tynedale district from 1974 to 2009. In 2011, it had a population of 11,829.Smaller towns and villages around Hexham include Corbridge, Riding Mill, Stocksfield and Wylam to the east, Acomb and Bellingham to the north, Allendale to the south and Haydon Bridge, Bardon Mill and Haltwhistle to the west. Newcastle upon Tyne is about 25 miles (40 km) to the east and Carlisle is 37 miles (60 km) to the west. The Holy Island of Lindisfarne, also known simply as Holy Island, is a tidal island off the northeast coast of England, which constitutes the civil parish of Holy Island in Northumberland. Holy Island has a recorded history from the 6th century AD; it was an important centre of Celtic Christianity under Saints Aidan of Lindisfarne, Cuthbert, Eadfrith of Lindisfarne and Eadberht of Lindisfarne. After the Viking invasions and the Norman conquest of England, a priory was reestablished. A small castle was built on the island in 1550. This is a list of places in Northumberland, in England. The area covered is the ceremonial county, hence the exclusion of places traditionally regarded as being in Northumberland which are now in Tyne and Wear for administrative and ceremonial purposes. See the list of places in England for places in other counties. This is a list of the National Register of Historic Places listings in Northumberland County, Pennsylvania. This is intended to be a complete list of the properties and districts on National Register of Historic Places in Northumberland County, Pennsylvania. The locations of National Register properties and districts for which the latitude and longitude coordinates are included below, may be seen in a map.There are 29 properties and districts listed on the National Register in the county. One site is further designated as a National Historic Landmark. Another property was once listed but has been removed. This is a list of the National Register of Historic Places listings in Northumberland County, Virginia. This is intended to be a complete list of the properties and districts on the National Register of Historic Places in Northumberland County, Virginia, United States. The locations of National Register properties and districts for which the latitude and longitude coordinates are included below, may be seen in a Google map.There are 26 properties and districts listed on the National Register in the county. Northumberland County is a county located in the U.S. state of Pennsylvania. As of the 2010 census, the population was 94,528. Its county seat is Sunbury. The county was formed in 1772 from parts of Lancaster, Berks, Bedford, Cumberland, and Northampton Counties and named for the county of Northumberland in northern England. Northumberland County is a fifth class county according to the Pennsylvania's County Code.Northumberland County comprises the Sunbury, PA Micropolitan Statistical Area, which is also included in the Bloomsburg-Berwick-Sunbury, PA Combined Statistical Area. Among its famous residents, Joseph Priestley, the Enlightenment chemist and theologian, left England in 1796 due to religious persecution and settled on the Susquehanna River. His former house (originally purchased by chemists from Pennsylvania State University after a colloquium that founded the American Chemical Society) is a historical museum. Northumberland County is a county located in the Commonwealth of Virginia. As of the 2010 census, the population was 12,330. Its county seat is Heathsville. The county is located on the Northern Neck and is part of the Northern Neck George Washington Birthplace AVA winemaking appellation. The Northumberland Rugby Union is the governing body for rugby union in the county of Northumberland, England and is one of the constituent bodies of the national Rugby Football Union having been formed in 1880. In addition, the county has won the county championship on two occasions, and finished runners-up on a further five occasions. The Royal Northumberland Fusiliers was an infantry regiment of the British Army. Originally raised in 1674 as the 5th Regiment of Foot, it was given the regional designation 'Northumberland' in 1782 and granted the distinction of being a Fusilier regiment in 1836, becoming 5th (Northumberland Fusiliers) Regiment of Foot. The regiment adopted the title Northumberland Fusiliers when regimental numbers were abolished under the Childers Reforms of 1881 and became the Royal Northumberland Fusiliers on 3 June 1935. In 1968, the Royal Northumberland Fusiliers, after service in many wars, including both World War I and World War II, were amalgamated with the other regiments in the Fusilier Brigade–the Royal Fusiliers (City of London Regiment), the Royal Warwickshire Fusiliers and the Lancashire Fusiliers–to form the present Royal Regiment of Fusiliers.